At International Yamanote Kindergarten we do our best to put your worries at ease. Not only do we have a preschool program called “Play School”, but we also offer after-school care for your child with our “Kids World” program. We are here to assist you in raising your precious children. This is a program offering various experiences including music, English, crafts, and more. With lessons 3 times a week, our youngest learners get to experience a variety of activities that will help them build their curiosity and intelligence as well as their bodies. We provide a range of activities and lessons that include English, music, swimming, as well as art activities using crayons as well as paints. In the first term, mothers join their child in class so they can see and understand everything about our classes. From the second term the children will eat school lunches and packed lunches. They will also interact with other students at the kindergarten and participate in events. This is a program designed to help the children fall in love with English. In this twice-a-week program the children experience life in English with a native English speaker. In doing so, they are able to learn the English language more naturally. 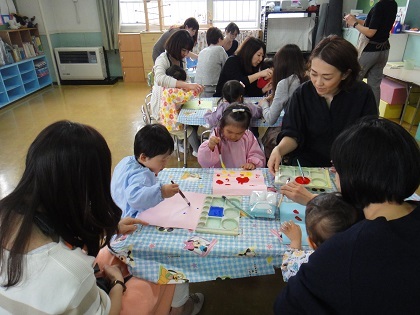 In the first term children join their mothers for English games and craft activities, and become accustomed to the English they will use in kindergarten life. As they learn to make the sounds used in English they become used to kindergarten life. From the second term the children have school lunches and packed lunches. They get to interact with the immersion classes and take part in various events. ～A Standard style class. A Japanese teacher leads this class in Japanese. 2019 Intake: Children born between April 2nd 2015 and April 1st 2017. Monday : Rhythm play with a music teacher. Wednesday : Crafts and Games. Thursday : Fun English lesson with the English teacher. Immersion style class, led in English by an overseas teacher. During the first term there will phonics and dance activities after lunch that can be attended by parents and children. Entrance Ceremony, Excursions, Crops Thanksgiving Day, Sports Festival, Halloween party, School plays, completion ceremony. Students who continue with International Yamanote Kindergarten will be given preferential class placement.